Ed. note: This week Mexico Business Blog is pleased to feature a contribution from our colleague Alvin Starkman, a specialist in Oaxacan culture and mezcal. 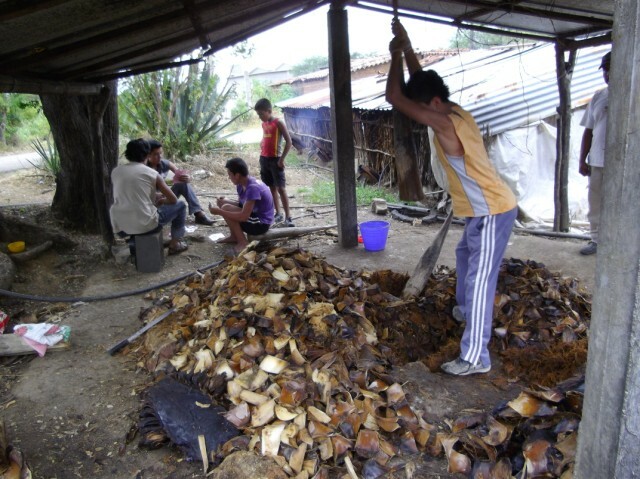 Starkman argues that a broader public policy vision is needed to protect the cultural and biological diversity of artisanally produced mezcal, and we agree. Mezcal’s star has risen to new heights with each ensuing year since about 2007, with no end in sight to its increasing popularity, export to new markets, and consumption. Knowledge of the diversity of Mexico’s agave-based spirit is finally starting to reach consumers outside of the particular region where it is distilled. Mezcal is en route to potentially becoming the globe’s most complex spirit, rivaling single malt scotch whiskies, with its innumerable flavor and aroma nuances. Mezcal aficionados, as well as those who have traditionally coveted a favorite tequila, scotch, brandy or other spirit, have begun to yearn for something new to stimulate the palate on a continual basis – just as oenophiles who appreciate or collect wines from certain regions, varietal types, and methods of manufacture. Mezcal offers a similar range. Consider the number of species and sub-species of agave (popularly known as maguey) used in production, the length of time it takes to grow a plant to maturity, variations in climatic conditions in those intervening years, the range of growing regions, the diversity of tools of the trade and means of production, and finally the plethora of infusing and aging factors. Jackson goes on to boldly assert that the most sophisticated of real drinks are the brandies of France and the whiskies of the British Isles, the most complex of the former being the cognacs and armagnacs, and of the latter those of Scotland and Ireland.2 It would have been hard to mount a convincing argument against the proposition in 2004;3 but a decade later, with more mezcal producers and exporters realizing the spirit’s capability of impacting the world stage, and many lobbying for a new form of federal regulation4 which would enable artisanal mezcal distilled in more states in Mexico to reach foreign markets, a case can be made for crowning the agave-based spirit if not now the king of sophisticates, then the distillate with the most promise to dislodge its top rivals. More species of the genus Agave are used to make mezcal than the number of species of any other plant material utilized in the production of other spirits.5 This fact in and of itself provides a convincing starting point, it is suggested, to support the proposition that mezcal has the capacity to become the spirit with the greatest number of flavor and aroma nuances. No essay on mezcal would be complete without an acknowledgement of the part that tequila plays in the world of agave-based Mexican alcoholic beverages. However, there are some important distinctions to be made. By law tequila can only be produced using one type of agave, Agave tequilana Weber (commonly known as blue agave).10 Thus, one cannot produce a mezcla with tequila, since the manufacture of the spirit is restricted in that only Agave tequilana Weber can be used. Fabrication of tequila is limited to Jalisco and circumscribed regions of four other states. Furthermore, artisanal production reaching foreign markets is relatively uncommon. In many cases the agave is not harvested from large, flat expanses of land with uniform soil and precipitation. For example, it can be cut from both sides of a river valley, with the agaves on each side yielding a mezcal with a different nuance. The sun impacts one slope differently than the other. Similarly, rain is not uniform because of wind direction. The plants at the top of a hill receive a different amount of precipitation than those at the bottom, and similarly the soil and surrounding vegetation will vary, further impacting final flavor and aroma. 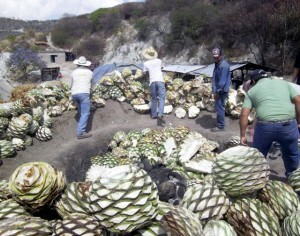 Most distilleries in Mexico are owned and operated by families, the members of which have been carrying on a tradition which has been passed down from generation to generation.16 Their recipes begin not with how and for how long they bake their agave, but rather what agave they use, as well as from where, how and when it is harvested. 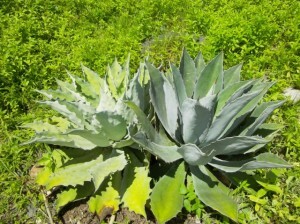 In modern times, more and more agave species are being used to make mezcal, in large part impacted by consumer demand. And while the use of wild agaves that have not traditionally been cultivated17 is now in vogue, it is something that has been occurring for centuries, based upon what wild species have been readily available for harvesting. 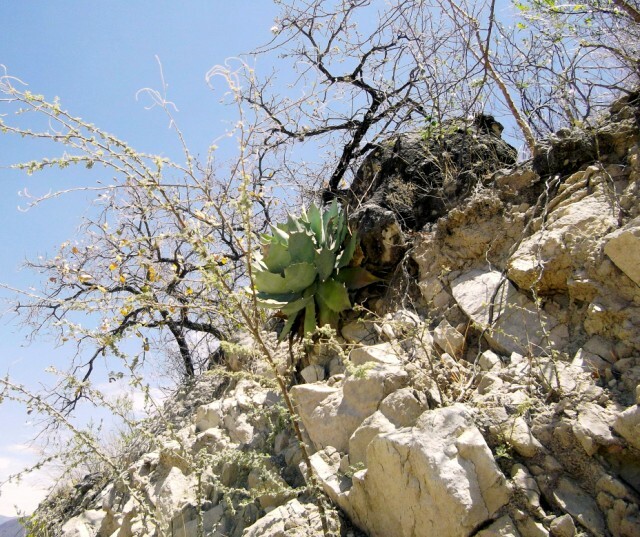 Although it has been noted that species are adaptable to different environments, magueyes generally have their preferred micro-climates. Accordingly, a family that lives in one part of the state will inevitably produce a mezcal which is somewhat different from a family producing in another part of the state, based upon the species and sub-species available and best suited to the region, the topography, and so on. Distillers do not always own the land from which their agave is harvested. They may pay a landowner for the privilege of using the terrain to plant, weed and finally harvest the agave; they may buy agave outright from growers or communities willing to part with communally owned maguey; or they may have some other arrangement. In between circos (rows) of agave, the landowner may plant any number of other crops, and change which ones he grows several times over the period of time that the agave is growing before reaching maturity. Crops could be corn, beans, squash, chickpeas, alfalfa, to name a few, each impacting and contributing to the uniqueness of the terroir where the maguey is grown. Time is a key factor in numerous other respects insofar as determining nuances adopted through distillation. Each distiller has his or her own idiosyncratic beliefs: how long to bake the agave using what kind of firewood, and then how long to let it sit exposed to the air after baking, before further processing. Regarding the latter, a palenquero (as small batch distillers are known in Oaxaca) just outside of the town of San Lorenzo Albarradas, lets his Agave potatorum (commonly referred to in Spanish as tobalá) rest in a mound for a couple of weeks, after it has been baked in a traditional in-ground oven, until a green mold forms on the exterior. Only then does he mash and ferment it. He believes that this enhances the flavor. Most other palenqueros have not heard of this; but his tobalá without a doubt has a remarkable, grassy/herbal taste. Similarly, while most distillers do not pour water into the in-ground otherwise airtight oven, through a hole in the top, while the agave is baking, some do, especially during hot weather months, claiming that this reduces charring of the maguey – necessarily impacting flavor and aroma. Some palenqueros have not even heard of this step, while some of those who have, give different reasons for the practice and indeed use it all the time, regardless of ambient temperature or other considerations. The composition, location, and to lesser extent size of fermentation vessels affect finished product. 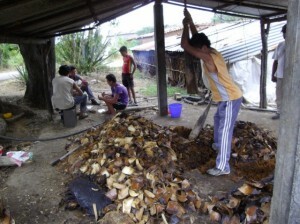 Industrialized operations use stainless steel, but in traditional distilleries some continue to ferment in animal skins, although most use wooden slat vats, the composition of which varies depending on the wood readily available in the particular part of Mexico, thus further contributing to flavor nuances. Most tubs are above ground, but some consist of rectangular shaped pits dug into the earth and lined with wooden planks.21 Some use tanks of clay brick covered with concrete, and some even use plastic drums.22 There are additional variations on the theme, each impacting the mezcal that ultimately drips out of the spigot of the condenser. 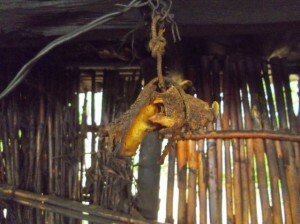 It is suggested that the equipment used to crush, be it a beast of burden pulling a tahona (stone wheel) over the agave, a mallet used to pulverize it in an in-ground stone-lined or in an above-ground planked wood canoa (canoe), or stainless steel cutting blades, does not impact the finished product. Some, however, would disagree, especially traditional Mexican cooks who steadfastly maintain that grinding corn, chiles, or other foodstuffs on a stone metate produces a far superior end result than when ingredients are taken to the local mill or pulverized in an electric blender. On the other hand, how finely the baked agave is mashed, regardless of by what means, inevitably determines the speed and extent to which environmental yeasts interact with the maguey, and thus, affects flavor and aroma. In-ground ovens differ greatly as well, in diameter, depth, and lining material if used at all (i.e. brick or stone, or in some instances depending on the integrity of the substratum, simply earth). Variables in firewood and the use of water during baking have already been noted. 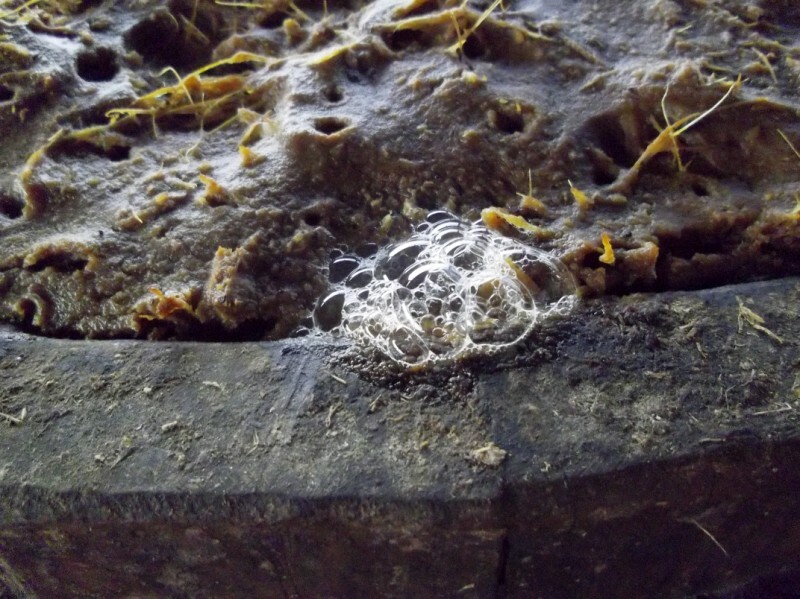 French uses a brick chamber on top of which agave is piled, with steam running through a series of tubes underneath. 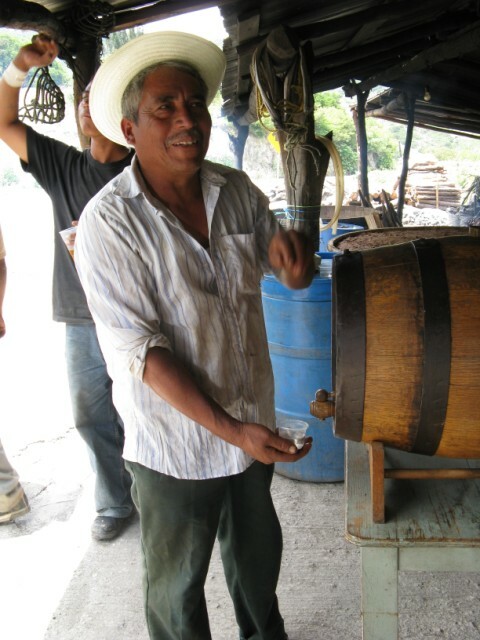 Enrique Jiménez who produces Mezcal del Amigo, Amores, Ultramarine, La Muerte, and Herencia del Mezcalero among other brands, uses a similar method for some of his baking, or rather in this case steaming. 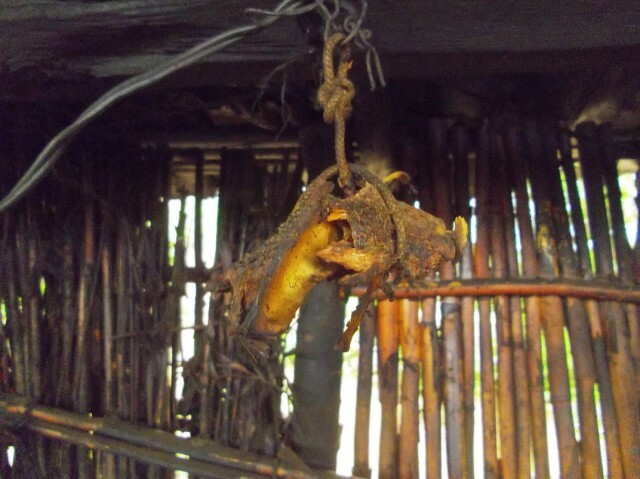 Smokiness is therefore reduced since there is no interaction with firewood. 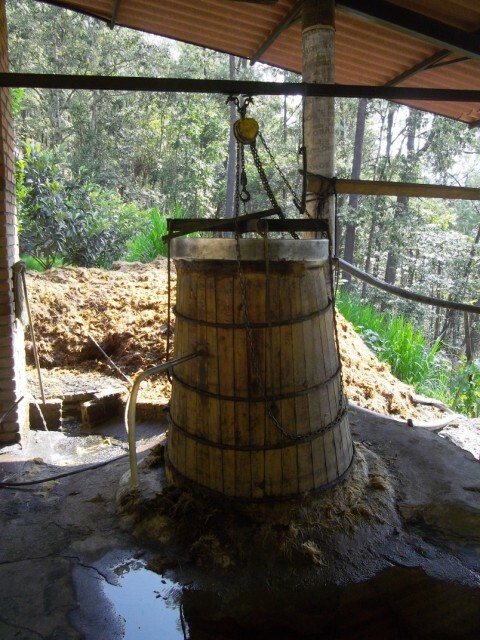 Size, shape, and composition of the distillation vessel vary to a significant extent in the production of mezcal, though there is a standard size and form of copper apparatus traditionally employed in the state of Oaxaca. Such differences affect flavor, richness, and weight of the spirit. Jiménez uses a multi-chambered copper still, which according to the federal regulatory body COMERCAM (Consejo Mexicano Regulador De La Calidad Del Mezcal, A.C.),25 produces a double-distilled product through a single process. He then employs a second unit, a copper column still, enabling him to produce a triple-distilled mezcal in two as opposed to three steps. The single unit clay pot still and condenser produces unique flavor and aroma nuances, as distinct from when copper, wood, galvanized metal and / or stainless steel are used, even though in most cases the condenser contains a metal cone. The composition of the clay pot (olla de barro) necessarily differs based upon the characteristics of the earth used in its fabrication, which varies depending upon the region of Mexico where the pot is made. Accordingly, the mezcal produced using ollas from one area of a state has properties distinct from that produced somewhere else. Mezcal may never be identified by the use of different barrel types, cask strengths or wood finishes like single malt scotches, for two main reasons. Firstly, it does not have to, since the other variables impacting flavor and aroma are so numerous. On the other hand, Jackson has pointed to the diversity of malts having greatly increased consumer interest in whiskies of all types,26 yet scotch continues to be marketed on the basis of aging mediums. Secondly, lobbying against aging has taken a fairly strong foothold, at least in the state of Oaxaca. Both Philion Muñoz and Torrentera attempt to convert novice mezcal aficionados and in so doing denigrate the concept of and value in aging of any type; and they seem to give short shrift to infusing.27 French, on the other hand, appears to be at the vanguard in terms of experimenting with aging mezcals made with different agaves. The potential in this area, however, lies in wait. Barreling of mezcal is still in its infancy, and in fact only began in earnest, at least in the state of Oaxaca, in the second half of the 20th century, when oak barrels began to be used not for the purpose of imparting flavor, but rather as a more convenient method for transport and storage, as compared to the earlier practice of using clay receptacles known as cántaros. Widespread storage in clay, imparting its own nuances, will likely never return,28 but barreling does show potential. There are numerous incarnations of what is generically now referred to as mezcal de pechuga. Turkey or chicken breast, deer meat and rabbit meat are known to be used in making the spirit, and no doubt there are many other animal proteins which are employed. Sometimes the protein is combined with a series of seasonal fruits, together with herbs and spices, with some of the additions placed in the bottom of the still vessel rather than hanging with the animal meat. And sometimes pechugas are made sans a meat protein, though it is suggested that perhaps they ought not to be deemed pechugas.35 Pechugas are gingerly made so as to retain the character of the agave as the principal flavor and aroma, and merely add a subtle hint of the products used to alter it. Pechuga thereby produces an entirely different range of flavors and aromas without diminishing the original nuance created by other factors as noted above. Santiago Matatlán is located an hour’s drive outside of Oaxaca. It is the self-proclaimed “World Capital of Mezcal.” Subsequent to the formation of COMERCAM early in this century,37 the number of palenqueros in and around the town dropped by about two thirds, in large part because of the regulatory body’s strict rules, extensive paperwork and cost of membership, all required to produce mezcal for export which meets its prerequisites. Small artisanal producers are being squeezed out of the marketplace despite their contributions to mezcal’s diverse offerings and their rich cultural heritage. Big producers and exporters succeed in large part because of the romanticism associated with traditional production by rural folk. Small producers throughout the country are in danger of extinction,38 unless the rules of the game are changed, unless there is a uniform labeling system which respects and promotes not only regional variation, but also the nuances unique to a particular micro-climate – yes, as in Highland, Lowland, Islay, Speyside, Campbeltown, and their sub-regions, the diversity of peats and seaweeds, and spring waters cascading their way down from snowy mountains over rocks and up from springs, and all the rest which has, in Jackson’s opinion, elevated single malt scotch whiskies to their current status. It is suggested that all spirits produced anywhere in Mexico using 100% agave should be called mezcal,39 and be able to be exported throughout the country and further abroad,40 and that any spirit with anything less than 100% agave should not be called mezcal. The world of spirits needs and deserves a competitor for single malt scotch whiskies. Let the industrialized agave-based spirits, and indeed the vodkas of the world fall into the melting pot of inebriants. Mezcal can realize its deserved and unbridled capacity, by resisting its homogenization masked under the guise of logos and labels, marketing motivated names, and ulterior, agenda-motivated regulatory paternalism. Alvin Starkman has written over 30 articles about mezcal, pulque and Mexican craft beer. His expertise lies mainly with mezcal production in his home state of Oaxaca. 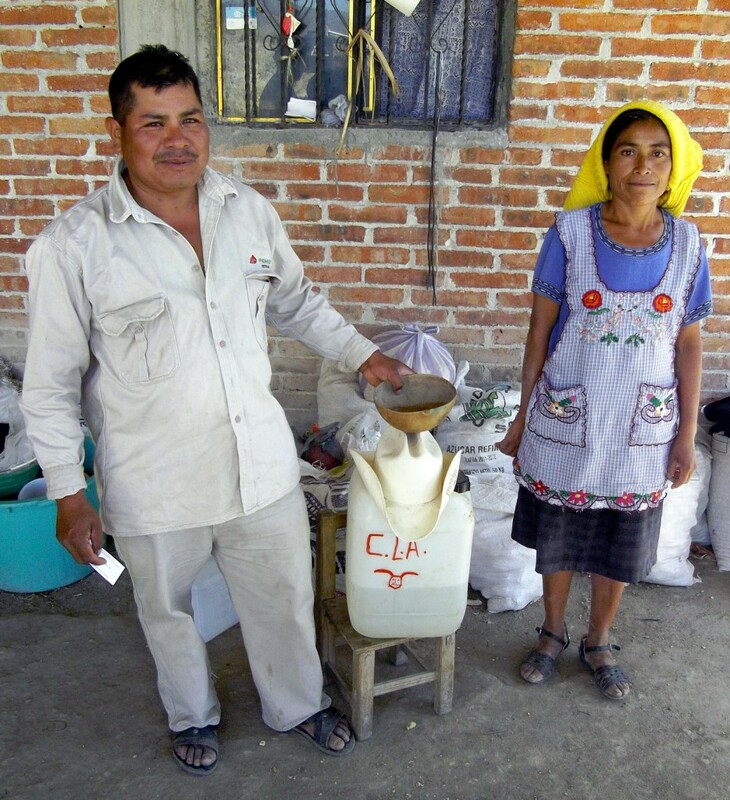 He frequently takes visitors to Oaxaca into the hinterland to learn about mezcal and pulque for their personal interests or to assist in their export aspirations. 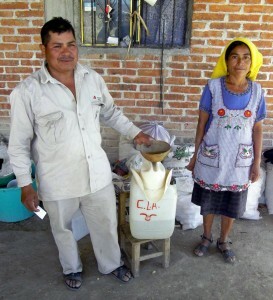 He operates Oaxaca Mezcal & Pulque, and Oaxaca Culinary Tours with Chef Pilar Cabrera Arroyo. 1 Michael Jackson, Complete Guide to Single Malt Scotch (Philadelphia, PA: Running Press, 2004), p. 37. 3 The year of Jackson’s publication, ibid. 4 See, for example, the highly opinionated treatise by Ulises Torrentera, Mezcalaria Cultura del Mezcal – The Cult of Mezcal (Oaxaca, MX: Farolito Ediciones, 2012) and the plea contained in Catarina Illsley Granich, 2010, “Keys to Savoring Mezcals,” Artes de México, 98 (Mezcal Arte Tradicional): 84-87. 5 Douglas French of Scorpion Mezcal states that no other distilled spirit category has 30 different base materials. On the other hand, Clayton Szczech of Experience Tequila indicates that schnapps and eau de vie in Europe are made from every fruit imaginable, as well as fruit pits, tree bark, etc. 6 Agave is one of eight genuses in the Agavaceae family, the others being Yucca, Beschorneria, Prochnyanthes, Furcraea, Herperaloe, Polianthes and Manfreda. 7 Reclassification is similarly not foreign in taxonomic discussions regarding barley, the grain exclusively malted to produce single malt scotch whiskies. 8 Ana G. Valenzuela and Marie Sarita Gaytán, 2012, “Sustaining Biological and Cultural Diversity; Geographic Indications and Traditional Mezcal Production in Jalisco, Mexico,” Revue de ethnoécologie, 2: 1-18. A commentator in a video produced for Los Danzantes mezcal states that 39 species are used to make mezcal, French pegs the number at 30, while Silvia Philion Muñoz, co-owner of a downtown Oaxaca tasting room, Mezcaloteca, puts the number at 25 – with sub-species of course. 9 Barley is at times imported to Scotland from other countries for producing single malt scotches, thereby augmenting diversity in the finished spirit, and of course the diversity of scotches is significantly impacted by the different micro-climates in Scotland, well documented and noted by distillers in promoting their products. 10 Since tequila can be made with 49% outside sugar sources (as compared to 20% for mezcal), in this way it can achieve some added flavor diversity, although only tequilas (and mezcals) made with 100% agave are considered the real deal. Tequila Don Julio’s new entry into the marketplace, a silver or blanco añejo (Don Julio 70 Añejo Claro), is perhaps evidence of tequila’s struggle to contend with a growing interest in different agave-based flavor nuances more readily achievable with mezcal. On the other hand, Tequila Ocho does produce at different ranchos each with a distinctly different surrounding terroir, though its tools of the trade appear rather uniform and sophisticated based upon a review of its website, http://www.ochotequila.com. 11 Abisaí Josué García Mendoza, 2010, “The Geography of Mezcal,” Artes de México, 98 (Mezcal Arte Tradicional): 82-83. 12 Ana G. Valenzuela and Marie Sarita Gaytán, ibid. Mezcal is not identified as such in several states, though often produced with 100% agave. 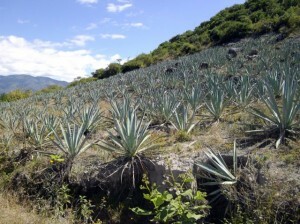 Other agave-based spirits in Mexico include bacanora, sotol, raicilla, sikua and distilados de agave. 13 Scottish single malts are categorized into only five or six whisky producing regions. 14 Juan Arturo López Ramos makes a convincing case for the proposition in Oaxaca, Cuna y destino de la Civilización América (Oaxaca, MX: Fundación Cultural Fernández Pichardo, 2010). 15 For example, one San Juan del Río, Oaxaca, distillery located high up above the town, draws its spring water from five kilometers further up the mountainside. The water used creates a unique flavor profile not found in the mezcals produced by the town’s other distillers. 16 According to Torrentera, agave has been cultivated in Mexico for upwards of 8,500 years (ibid., p. 50), although best convincing evidence suggests that distilling (as distinct from fermenting) did not being until the arrival of the Spanish, either in the second half of the 16th century or in the 17th century, depending on the source relied upon. Curiously, the cultivation of a barley prototype also dates to the same era, shortly after hunters and gatherers in the fertile crescent of the Middle East began settlements (Jackson, ibid., p. 25). A brief, objective summary of the case for pre-Hispanic distillation is found in Patricia Colunga García Marín, Daniel Zizumbo Villareal, Fernando González Zozaya, Ángeles Olay Barriento, Rafael Platas Ruiz, Mariza Cuevas Sagardí and Laura Almendros López, 2010, “Mezcal: A Pre-Hispanic Mexican Art?,” Artes de México, 98 (Mezcal Arte Tradicional): 87-88. 17 Experimentation is proceeding at a feverish pitch to grow these traditionally wild agave from seed, to work with hybridization, etc., all to satisfy growing demand and capitalize on greater consumer palate sophistication. In addition, there is a concern that some sub-species are becoming endangered as a result of overharvesting. Some distillers foresee an exacerbation of the problem and are attempting to address it. Questions remain, however, as to how to appropriately deal with shortages, ecological impact and related matters, if export to foreign markets continues at its current pace. 19 As exemplified by both the single unit clay pot still and the two part copper still and condenser unit. 20 See Araceli Minerva Vera Guzmán, Mercedes Guadalupe López and José Luis Chávez-Servia, 2012, “Chemical Composition and Volatile Compounds in the Artisanal Fermentation of Mezcal in Oaxaca, Mexico,” 11(78): 14344-14353, for the culmination of research in Tlacolula and Matatlán, Oaxaca, which deals with differences in fermentation depending on season (Spring and Fall highlighted). 21 For example, at the distillery of Mezcal Don Mateo in San Miguel del Monte, Michoacán. 22 Where full disclosure prevails, the free market ultimately determines the popularity of mezcales produced using plastic receptacles in which to ferment. The same holds true regarding stills made from sterilized oil drums, referenced further along in the body of this essay. 23 For example, at Mezcal Benevá, located between the city of Oaxaca and Tlacolula de Matamoros, along the same stretch of highway as Zignum (of Armando Guillermo Prieto), the new Casa Chagoya facility, and just off the highway at San Lucas Quiavini a yet-to-open government sponsored plant. 24 For example the palenques of Felix Ángeles Arellanos of Santa Catarina Minas, just outside of Ocotlán de Morelos, and of the Sánchez Cisneros family of Pueblo Viejo, a tiny hamlet an hour’s drive from San Juan Mixtepec, in Oaxaca’s Mixteca Alta. Is a distillery which deviates from this “primitive” model only in that it crushes it’s baked agave using gas or electric powered machinery, still considered to be the most rudimentary, or is it one step over along the continuum? 25 COMERCAM oversees production and certification of mezcal for domestic sale and international distribution with a view to maintaining quality control in the marketplace. 26 Ibid., pp. 7 and 21. 27 Although credit must be given to each of them for their efforts at educating both novices and spirits aficionados alike. 28 Though still used in conjunction with the odd distillery. And storage in animal skins has all but disappeared. 29 Barrels are often imported to Mexican distilleries broken down, and then re-assembled by specialists at the trade, known as barriqueros. 31 Actually a larva which infests the agave and certain nearby plants. 32 As many assert is the case with barrel aging. 33 See the author’s article about the origins of pechuga, found here: http://www.oaxaca-mezcal.com/2/category/mezcal%20de%20pechuga%20oaxaca/1.html. 34 Pierde Almas and Mezcal del Maguey brands sell in the state of Washington, known for its high liquor taxes, for in excess of $200 USD for 750 ml, and Pierde Almas made with rabbit meat for almost $400 USD. 35 Perhaps more appropriately labeled as vegetarian pechugas. 36 It is cautiously suggested that a recently initiated federal program may be making inroads towards change. 37 The distillery accreditation process began in 2003, but the organism was actually formed in 1997. 38 Subject to the progress noted in the previous footnote. 39 Save and except for tequila; and if the makers of other 100% agave based spirits deem it advantageous to them to retain their popular names, then those spirits as well, subject to their right to switch over and onto the mezcal bandwagon. 40 Subject to complying with reasonable prerequisites aimed at maintaining quality control while at the same time promoting mezcal’s complexity and innumerable flavor and aroma nuances. It is beyond the scope of this essay to suggest detailed parameters. The likes of Torrentera and Granich, and others without a financial agenda, have considered the alternatives, with the same objective in mind as that of this writer. 41 It is acknowledged that notation of locale of fermentation is important given the difference in yeast compositions from region to region, but addressing a viable solution to the issue is beyond the parameters of this essay, and it is conceivable that such minutiae of delineation might not be workable. 42 Query whether there is greater economic value for Mexico (i.e. spirits tourism) in preserving premium mezcals for predominantly domestic consumption. On the other hand, this begs the question of how can mezcal become elevated to single malt scotch or other superior spirit status if there is relatively little global access to it. A very knowledgeable article on a topic on which I have recently discovered there is no shortage of opinions, philosophies, or even dogmatic positions. Well written, objective and balanced. Thank you, Mr. Starkman, I hope to be able to visit you in the near future. Another thoughtful article from Mr.Starkman, full of insight and expertise. Hopefully more and more people will come to understand and appreciate the craftsmanship of mezcal producers….especially those multi-generational “small batch” producers of Oaxaca. One of the great pleasures of mezcal to me is the variety and the histories behind each of them. Nice article, very well sourced and complete! Thanks.